The global economic slowdown continued to dampen U.S. manufacturing, which contracted in August for the third month in a row, according to the Institute for Supply Management. The trade group’s index showed new orders as well as exports shrank for the third month in a row. Production contracted for the first time since the Great Recession ended three years ago. Led by lower spending on existing houses, construction expenditures took a surprise dip in July. The Commerce Department reported the first monthly decline in construction spending in four months. However, investments in new residential structures – both single-family houses and multi-family complexes – continued to rise, providing further evidence that the housing industry is recovering. Americans bought more motor vehicles than analysts expected in August. Auto Data Corp. reported that dealers sold an annual rate of 14.5 million vehicles for the month, up 3% from July and up nearly 17% from August 2011. It was the highest rate since the federal Cash-for-Clunkers stimulus program three years ago. Domestic cars led the sales. Employers reluctant to add to their payrolls were able to get more productivity out of their existing workforce in the second quarter, according to revised data from the Bureau of Labor Statistics. Output per hour increased at an annual rate of 2.2%, as employees worked fewer hours than initially estimated. Productivity has increased three times in the last four quarters, but economists say at some point employers need to hire more workers. 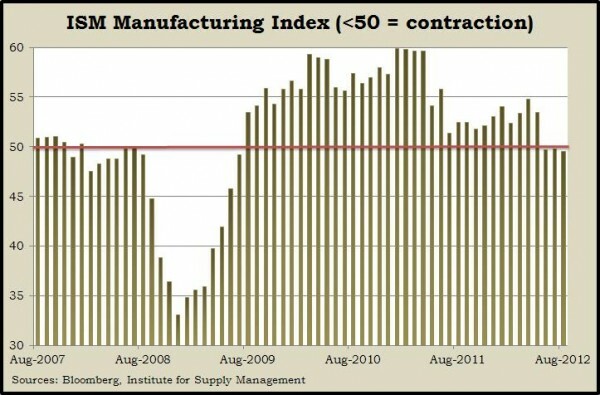 The Institute for Supply Management reported the 32nd consecutive monthly boost in non-manufacturing activity in August. Led by a turnaround in employment, which contracted in July, the non-manufacturing index showed slowing growth for new orders and stronger demand for exports. A survey of purchasing managers found a common sense of uncertainty about economic and business conditions. The moving four-week average for initial unemployment claims rose for the third week in a row. The average level of new jobless applications reached its highest level in seven weeks, though it remained down 9% from the year before. Considered an indicator of employers’ appetite for hiring and firing workers, the jobless claims have been little changed since dipping below a critical level of 400,000 weekly filings late last year. Employers added fewer jobs than expected in August and not as many as previously estimated in June and July. The Bureau of Labor Statistics reported that the monthly pace of job gains so far in 2012 has dropped 9% from the 2011 rate, and more than three years after the Great Recession officially ended, employment is not even halfway back to where it was at its peak. The most positive indication from the monthly report was that the unemployment rate dropped to 8.1%, but that was because more people have been avoiding the job market.